Before going to topic please refer topic "10tips to grow vegetables"
What is the difference between tuber and root? A tuber is a modified stem that grows in the soil. Potato is one such tuber. A)Climate: Potato love cool Indian climate(Nov-Jan) below 26C. Don't love high moisture content in soil or rains. B)Soil: Loves well-drained soils like sandy soils with a high percentage of organic matter. 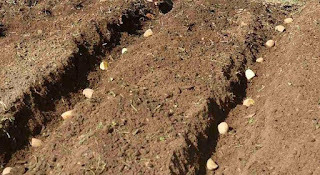 Give high yields in soils which have pH 4.5 to 5.5(slightly acidic).dislikes clay soils. C)Seed: Approx 1200kg per acre seed required each tuber weighing approx 50g and approx 45mm diameter. Select virus free and disease free seeds from the farmer. Nowadays people cutting potatoes into pieces based on their eyes, it's highly dangerous and results in an unhygienic seed. D)Duration: 70days under full sunlight. It takes 90days to harvest if there is no proper sun. E)Spacing: 30cm plant to plant. 60-90cm between rows. The aim is to plant at least 50,000 plants per acre. F)Feild Preparation: potatoes need more organic content in the soil. It can be grown on compost heap also. While compost gets ready, potatoes come to harvest. 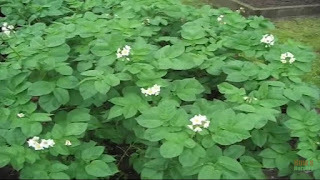 Grow green manure before potato crop. Traditional practice is applying 20tons of FYM or 5tons of compost with 500kg of Neem cake. G)Sowing Method: Sow seed 30cm deep cover some soil. Cover with entire soil gradually along germination and seeing leaves. This gives support to plant. Remember each eye on potato will produce 5-10 potatoes. 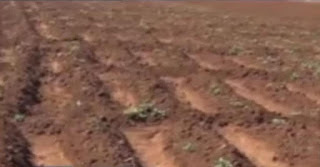 H)Irrigation: initial irrigation before sowing. Irrigation was required every week. Especially before flowering. Irregular irrigation results in tuber split and irregular growth. Maintain specific time every day at least irrigating deep 20cm soil gives best results. Give mulch for soil if the climate is too hot outside.These plants don't like over irrigation. Overwatering, stagnation leads several viral/fungal diseases and tuber rot. I)Intercrops: Radish, Garlic, Onion, beans, peas, Mustard and marigold. J)Harvest: if flower drops it's ready to harvest, it can be prolonged until leaves turn full yellow. The average yield of 11-15 tons of harvest per acre. *Four kg of Neem seeds are powdered and dissolved in 100 litres of water and filtered. Add 10 litres of cow urine and mix it with 50 gm of soapnut powder. Spraying this extract will control many pests and diseases of potato. *Install light traps from 6-10pm to overcome white grub and cutworm adult moths in summer. 1.How long potatoes are safe after harvesting? After 7 days if we keep in normal conditions it tastes sweeter. Loses original taste. Potatoes should be strong (as a rock) when we press in your hand. 2.So no need to look for eyes/ scars n simply plant about 50-gram piece. If one tuber is affected with virus or disease with a knife(while cutting eyes) it will spread to all tubers. If farmers are professional to take care precautions no issues.But it's impossible in a higher level of cultivation. 3.You said potato is risky for beginners. Due to the cost of cultivation? Or field work involved? Seed cost, expertise in sowing and predicting harvest time is not so easy for beginners in my view, depending on spacing seed cost may even go up to 40% of total cultivation.